Are you a mechanical engineer, industrial designer, or a design engineer who uses CAD modeling to design products to be injection molded? Then this guide is just for you. At Jaycon Systems, we are big believers of DFM — or Design For Manufacturability. 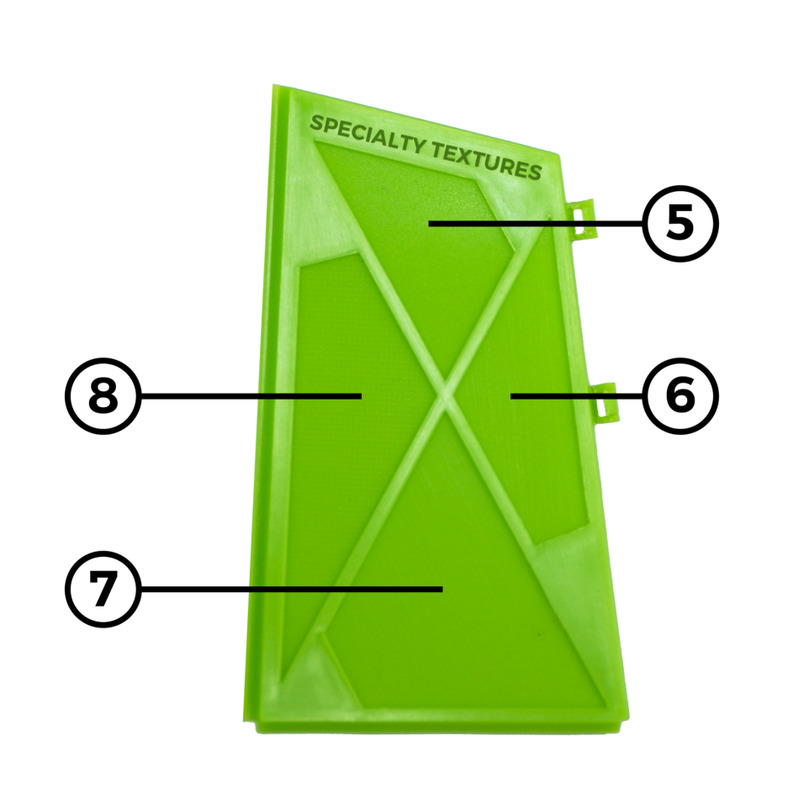 If you’re not familiar with the term, no worries, request your Injection Molding Design Tool + Pencil Holder today and follow along this article to get a full explanation of how DFM practices go hand-in-hand with your design. DFM is the practice of designing products on the computer while keeping in mind the manufacturing process that it will be produced on. A simple example would be 3D printing vs. CNC Machining. During the 3D Printing process, we add material to form a shape, wherein CNC, we remove material to form a shape. In the latter, it would be near impossible to have a hollow part that was produced with CNC Machining. A good engineer will design parts that are optimized for each process — and injection molding is no different. There are many benefits to injection molding, but there are some requirements to be followed as well. And with any manufacturing process, there are also limitations that when tried to bypass, can get expensive because of the additional tooling required to make a part. Visualizing these injection molding requirements can be beneficial to engineers who are in the process of 3D modeling or prototyping a part. Below you will find an explanation of every side of the pencil holder and its feature. Follow along, and we hope by the end you will have a better idea of what to take into consideration when designing products for injection molding. Without further ado… Let’s get to the features of this design tool! Starting with the Standard Textures Side, you will see some of the most common textures our clients apply to their plastic parts. Although you may think there is not much difference between these, a little bit more or less grittiness can totally change the feel of your product. These textures will add a generic roughness to plastics, and each number below is a different level of roughness. On this side, you will find textures that are a bit more unusual. They are part of our specialty textures collection. Besides the ones shown below, we have hundreds of specialty textures available, such as wood grain, custom patterns, etc. We know that every project is different and our clients may require unusual finishes, so we work with them to ensure that texture follows function (no pun intended). Upon receiving your Design Tool, you will notice the textures better than from the pictures below by touching and moving it at different angles to see the details. In order to ensure proper flow of plastic, parts need to be shelled so that they have hollow insides. Shelling helps prevent sink marks on the faces of the part by ensuring that all walls have the same thickness. Notice the shelled part (top) has even surfaces, while the solid part (bottom) has dimples, or shrink marks. When figuring out the most optimal wall thickness of your product or part, there are a number of variables that are taken into consideration— most importantly, though, would be the type of material in which it will be made of. 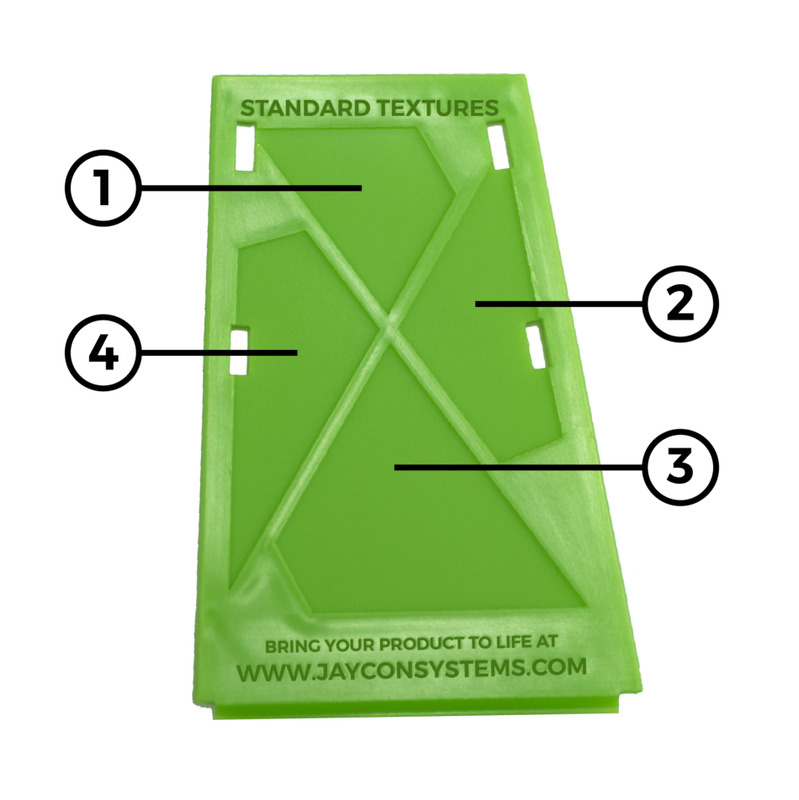 Flip your Jaycon’s Design Tool inside out, and on the back, you will notice sink marks just around the area where the material steps down from one thickness to another. The section that is too thin (25%, third from top to bottom) has larger sink marks on the back, is brittle, and becomes translucent. Ribs in parts are generally used to support long or thin sections of plastic, giving that section more strength. If a rib is too thick, it will leave sink marks on the other face as seen on the back side of your pencil holder. When including ribs in your design, follow the general rule of thumb of making the rib’s thickness no more than ⅔ of the wall it is attached to. Living hinges allow two sections of plastics to be connected. This is very common on products such as shampoo or ketchup caps. Sometimes a product may benefit from having a hinge, as opposed to adding hardware. Keep in mind that not all plastic materials allow for living hinges, as some will break since they don’t allow for flexibility. Most products with living hinges are typically made out of polypropylene. Whether you want to include certification markings, company name, or other relevant information on your product, the reality is that most plastic products out there have some text on them. And there are two ways of doing this: Embossed is where the text protrudes out of the part and debossed is where the text sinks into the plastic. Keep in mind that when CNC machining the mold that will make the plastic part, debossing usually takes longer and requires more material around it has to be milled away, making it more expensive than just embossing it. Ultrasonic welding is exactly what it sounds like. It is when two plastic parts are vibrated at frequencies that cause them to fuse together. But they don’t fuse together just by being made out of plastic—they require energy directors. Keep in mind that there are proper ratios in which an energy director is designed in a part. The image below shows the top of a wall and the size of the energy director in reference to the wall thickness. The ratio of wall thickness to the height of the 90-degree triangle is 8:1. Ideally, the triangle height is ⅒ to ⅛ the width of the wall on which it resides. The image below shows the orientation of the weld line. In your pencil holder, you will notice two openings. The tube that is made with a cam costs more to produce since the hole is perpendicular to the way the mold halves separate. In order to achieve such feature, an extra rod-like item is inserted between the mold halves. In contrast, the straight pull usually does not cost any more money since it is produced just by raising and protruding the tube design in the mold itself with no additional parts. Here are undercuts to form snap hooks. The one on the right, requiring a cam, will always cost more since the undercut cannot be formed with a simple 2 piece mold. Just like the example above, extra tooling is required in order to achieve that feature. The straight pull snap hook (left), in comparison, can be made with no extra tooling since the hole allows the 2-piece mold to open and close normally. 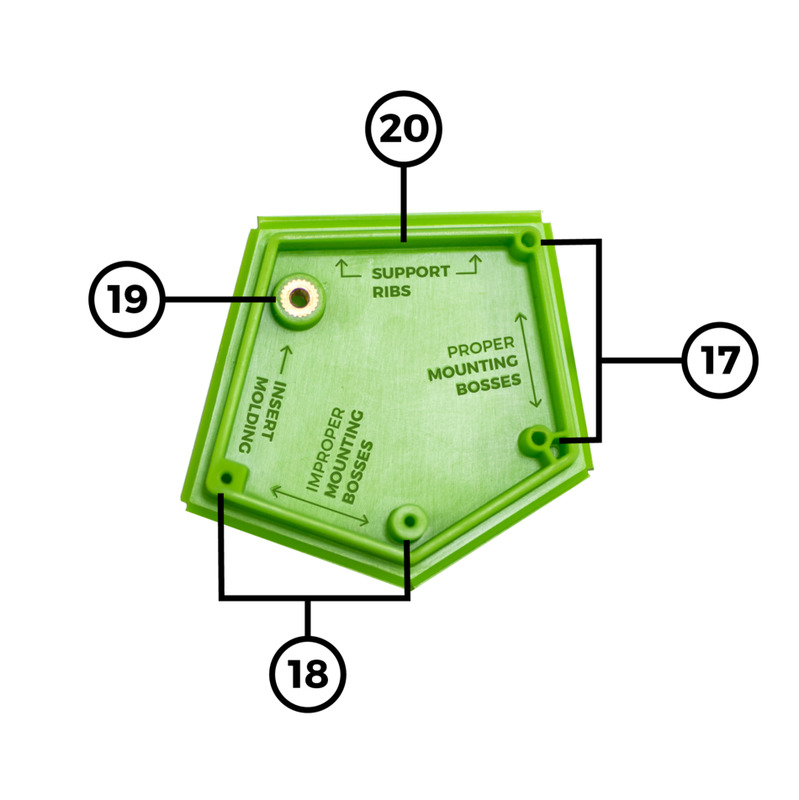 Both mounting bosses indicated on number 17 are correct given that neither of them will cause a sink mark in the support rib or disturb the flow of the plastic during the molding process. This is due to the relative wall thickness of the mounting bosses and any support ribs when compared to the adjacent walls. Refer to number 11 in this article for proper ratios. In these two examples, the mounting bosses are too thick when compared to the nearby walls and plate that they are on. One is also squared off instead of rounded, which will cause the improper flow of material and result in sink marks on the plate and/or nearby walls. They also may cause issues with the material flow when being molded, such as air bubbles or holes in the plastic. In many cases, as you see in the round improper mounting boss, inexperienced designers may want to compensate structure by increasing the thickness of the mounting boss when disconnected from a rib, which will have an even more negative impact on the structure of the part. Instead of post inserting hardware into plastic parts, in this example, a metal hardware is embedded in the plastic, allowing it to fuse with the part while it is being produced. The metal component is inserted into the mold prior to having molten plastic flow into the mold cavities. Here is an example of the support ribs from number 11 in this article. These ribs add rigidity to the plate as well as allow for other items such as mounting bosses to be present within its boundaries. And that’s all, folks! If you have additional questions or would like more information about designing for injection molding, please check our Engineering Guidelines to Designing Plastic Parts for Injection Molding. And again, if you haven’t ordered your Pencil Holder + Design Tool, you can do so here. Please allow between 7–10 business days to receive it.